A compact and sturdy universal hitchlock that fits to any standard non-stabiliser hitch including braked and unbraked units. The Al-Ko Universal is easy to fit on even the most awkward hitches with 50mm ball coupling. 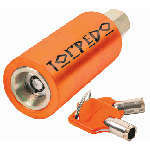 This is the recommended hitch-lock for Camp-let trailer tents. Cheap hitchlock option supplied with 2 keys and fits to the handle release trigger to prevent the hitchlock handle being operated and stop your trailer being unhitched or hitched to another vehicle. Caravan corner steady lock which secures your corner steadies in the down position so that your caravan can't be taken from the campsite. 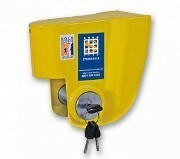 Insurance approved hitchlock for open handled hitches including standard Al-Ko, Albe, Harrison and B&B hicthes. Round profile parking post, contains a strong metal construction with durable locking base secured with 4 bolts (supplied). Saracen Gullwing - Thatcham Tested Hitch Lock has been developed to be quick fitting, convenient and a highly secure anti-theft device. Insurance approved caravan hitchlock with Sold Secure Gold rating. 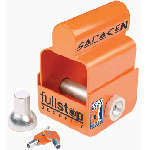 The Fullstop Saracen hitchlock fits when unhitched and hitched to prevent caravan from being taken from service stations.